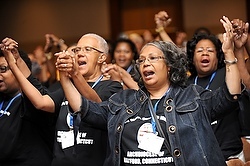 Attendees at the National Black Catholic Congress XI sing July 19 during the gathering in Indianapolis. INDIANAPOLIS (CNS) — Hands were raised in prayer and gospel music echoed in a large ballroom at the J.W. Marriott Hotel July 19 as some 2,500 attendees from across the country gathered for the start of the National Black Catholic Congress XI in Indianapolis. As each diocese was named, groups large and small, with many attendees wearing colorful T-shirts, stood up and cheered. The congress in Indianapolis was the first one attended by permanent Deacon Lawrence Houston, who ministers at St. Peter Claver Parish in New Orleans. After Father Whitt’s presentation, congress participant Vicki Lott of the Diocese of Austin, Texas, said that she likes attending the congresses to share fellowship with black Catholics from across the country that have both enjoyed the blessings of the Catholic faith, but also suffered from racism of some members of the church. Lott said there have been occasions when she has offered her hand at the sign of peace at Mass only to have other people turn their back on her. “I thought I was the only one who had experienced that,” Lott told The Criterion, newspaper of the Indianapolis Archdiocese. “It’s gotten much, much better in the past 10 years in my opinion. But it’s good to know that I wasn’t experiencing that pain alone. Ajani Gibson came to the congress from his home in New Orleans. He will be a sophomore at the Catholic University of America in Washington this fall, where he is majoring in philosophy. He agreed with Father Whitt’s assessment that black Catholic youths and young adults need to have their Catholic identity strengthened. He hoped to contribute to that effort by serving as a speaker to young people in sessions at the congress on social media and the new evangelization and on spirituality for young men. “We need to focus on getting our young people into church,” Gibson said.